alaTest has collected and analyzed 688 reviews of Dell Streak 7. The average rating for this product is 3.4/5, compared to an average rating of 4.5/5 for other products in the same category for all reviews. People are impressed by the portability and price. The usability and size are also mentioned favorably, whereas there are some critical views about the reliability and battery. Opinions are divided on the camera. We analyzed user and expert ratings, product age and more factors. Compared to other products in the same category the Dell Streak 7 is awarded an overall alaScore™ of 87/100 = Very good quality. The 7-inch version of Dell's Android-powered tablet is fast, but it's saddled by dismal battery life and poor design. One of the first Tegra 2 tablets, the Dell Streak 7 shows the promise of Nvidia's speedy mobile processor, but struggles in several different ways. This is not the 'droid you're looking for. Tegra 2 processor makes it the fastest tablet we've tested. Sensitive capacitive touch screen. 5-megapixel camera with LED flash, front-facing camera. Download/upload speeds not comparable with other 4G devices. Preloaded apps for video and photo use lower resolution and image quality by default. Video chat apps are nearly unusable. Poor battery life. Editors' note: Thanks to the release of recent, high-quality tablets, the overall score of the Streak 7 has been adjusted down from 7 to 5. 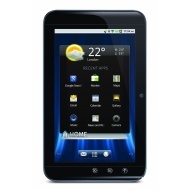 The Dell Streak 7 tablet offers dual-core processing, 4G network compatibility, Adobe Flash 10.1 support, front and rear cameras, and an inventive reimagining of Android 2.2. Dell's Stage interface doesn't make up for the stale operating system. Screen quality and responsiveness are not as good as they could be. The Dell Streak 7 polishes Android 2.2 to a tablet-worthy shine, and is the first to deliver 4G compatibility--but it's not enough to distract us from the incoming wave of Android 3.0 tablets. Tablet Phone. Notebook editor meets smartphone - no, actually a MID (Mobile Internet Device) for sticking to Dell's classification of the Streak. Read in our review about how this adventure will turn out and what you can expect from this device.